What is the right multiple to pay for S&P 500 earnings? Historically since 1935, the average P/E, using four-quarter-trailing reported earnings, was 17.1. It was 23.7 during Q1-2018. That’s a high reading. However, since 1990—a period of relatively low inflation and interest rates—the average P/E was 25.5. 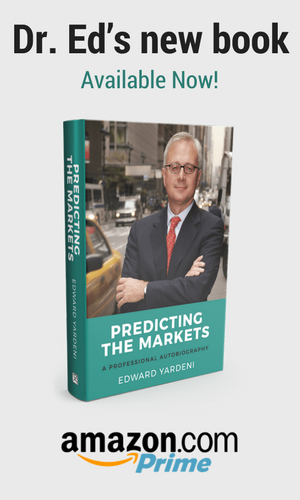 I am not a fan of P/Es based on trailing earnings, as I explain in my new book, Predicting the Markets. I prefer to focus on the forward P/E of the S&P 500, which is based on the time-weighted average of analysts’ consensus expectations for operating earnings during the current year and coming year. It has averaged 13.9 since the start of the monthly data series during September 1978. It recently rose to a 16-year high of 18.5 during January and fell to 16.5 during May. The forward P/E based on estimated earnings has been lower than the multiple based on four-quarter-trailing earnings because analysts are looking forward, not backward. There’s one major flaw with the forward valuation approach: Analysts’ earnings estimates tend to be unrealistically inflated in advance of recessions because analysts collectively never see recessions coming until it is too late. Once they do, they slash their earnings estimates at the same time as reported earnings take a dive, and share prices take an unanticipated hit. Conversely, the flaw with P/Es based on trailing earnings, which produce the higher multiples of the two approaches, is that they tend to turn bearish much too early in a bull market. The higher the multiple, the more likely it is to be deemed unduly heady as a bull market continues. Since I don’t see a recession in the foreseeable future, I continue to focus on the forward P/E, which isn’t alarmingly high, in my opinion. The further out that a recession is perceived as likely to happen, the more sustainable are above-average P/Es. That’s because long expansions give investors the time to see earnings grow, as predicted by industry analysts. I currently don’t expect a recession over the rest of this year or in 2019. What about 2020? Ask me again in 2019. As long as inflation remains subdued, as I expect, odds are that the expansion will go on and on—until further notice. My Blue Angels analysis compares the S&P 500 stock price index to its implied value using weekly forward earnings multiplied by forward P/Es of 10.0 to 19.0 in increments of 1.0. Just for fun, let’s compare the index to its implied value using a multiple of 15.0, which seems to be widely viewed as a fair-value multiple for the S&P 500 both by forward-looking and backward-looking investment strategists. The monthly version of this analysis starts in September 1978, while the weekly version is available going back to March 1994.